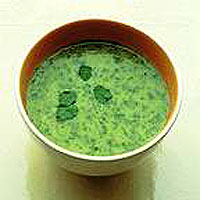 Watercress and Little Gem lettuce makes a light and pretty green soup that is equally good served hot or cold. Peel and chop a medium potato and trim and roughly chop 1 bunch of salad onions. Simmer them in 600ml chicken or vegetable stock for 10 minutes. Shred 1 organic Little Gem lettuce and add to the pan. Simmer for 10-15 minutes until the vegetables are completely tender. Process in a blender or food processor until smooth. Add enough milk to make the soup the desired consistency, then add a bunch of organic watercress, washed, trimmed and roughly chopped. Process for a few seconds. Heat to simmering point then stir in a little yogurt or crème fraîche. Serve hot or chilled, garnished with a sprig of watercress. This recipe was first published in May 1998.